The Gear to Help You Become a "Flying Ace"
Please Note: Inventory levels for these items change rapidly. For a complete list and current inventory info, Contact Us. Freestyle is anything you can think to do with a Frisbee, from backyard tricks with your friends, to routines set to music at tournaments held around the world. What do you get when you combine football, soccer and your favorite flying toy? 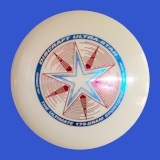 Ultimate Frisbee! A fast-paced and exciting sport that's played all over the world. Some of our favorite non-traditional discs are featured in our novelty disc section. Choose from cloth discs, big discs, mini discs, finger spinners, etc. • All discs are the highest quality available! • No factory seconds or blems! • No order is too big or too small! Don't want to use PayPal? Read this.